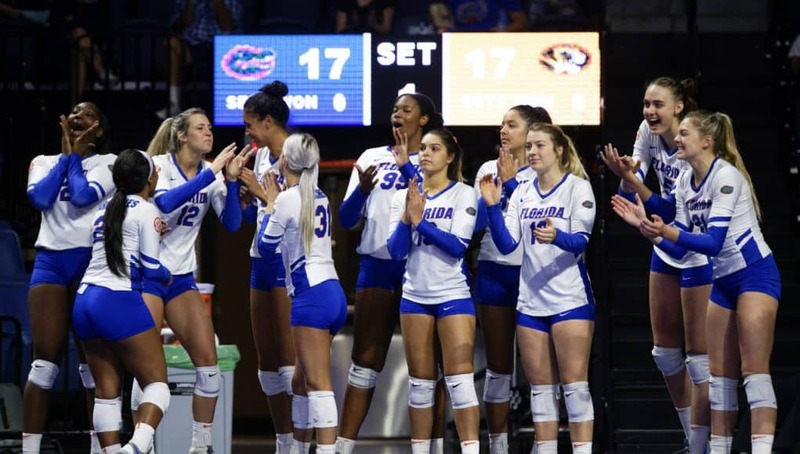 ORLANDO, Fla. – The 13th-ranked Florida Gators defeated the Florida State Seminoles in straight-sets during the first round of the NCAA Tournament on Thursday night. Florida moves to 22-0 in the first round of the tournament and improves to 13-14 in neutral site matches. UF took the first set, 25-21, then followed with a 25-20 win in the second frame. Florida clinched the match with a convincing 25-13 win in the final set to keep the season alive. The Gators were led offensively by Paige Hammons, who posted 16 kills during the match, tying her career-best. Rachael Kramer and Thayer Hall followed with nine kills apiece, while Taelor Kellum posted seven. Allie Monserez dished out a team-leading 20 assists – her 29th time leading the team in assists this season. Marlie Monserez added 16 assists of her own during the match. As a squad, the Gators notched 11.0 blocks, led by nine from Rachael Kramer. The junior also had nine blocks the last time these two teams met in Sept.
With the win, Florida has now won at least 25 matches in each of the 28 season under Mary Wise. – Florida held an 11-5 advantage early in the first set, forcing Florida State to use a timeout. The Gators continued to hold onto their lead, going up 19-14. FSU followed with a 4-1 run, getting to within two, but the Gators were able to close out the set on a service ace by Rachael Kramer. o Florida hit .214 in the first set, recording 14 kills along the way. Paige Hammons registered five kills in the frame – hitting .500 – and Taelor Kellum and Thayer Hall both pitched in three of their own. 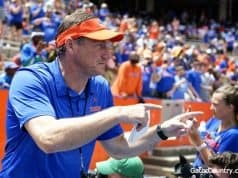 – UF found itself down 6-2 early, but the squad fought back to even it up at 7-7. From that point on, the Gators went on a 14-5 run, taking a 21-12 lead in the process. FSU battled to within four points at 23-19, but Florida secured the frame with two kills from Rachael Kramer. o The Gators hit .286 in the second frame, collecting 16 kills along the way. Once again, Paige Hammons registered five kills, followed by four from both Rachael Kramer and Thayer Hall. – With the third set tied 10-10, the Gators went on an 8-0 run behind the serves of Allie Gregory. FSU got within eight points at 20-12, but it was Gators the rest of the way as they closed out the set on a kill by Paige Hammons. 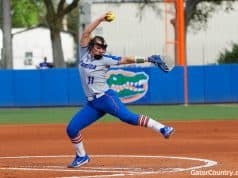 o UF hit .333 in the third and held the Seminoles to a .107 hit clip. Paige Hammons posted six kills in the frame, while Rachael Kramer and Taelor Kellum each added three. 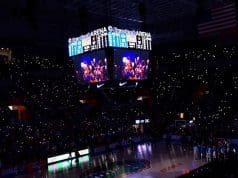 – The Gators advance to the second round of the NCAA Tournament, playing the winner of UCF/FGCU on Friday at 7 p.m.